For the past six weeks, we’ve been talking about employee equity on MBA Mondays. We’ve covered the basics, some specifics, and we’ve discussed the main form of employee equity which are stock options. Today we are going to talk about two other ways companies grant stock to employees, restricted stock and restricted stock units (RSUs). Restricted stock is fairly straight forward. The company issues common stock to the employee and puts some restrictions on the stock. The restrictions typically include a vesting schedule and some limits on how the stock can be sold once it is vested. The vesting schedule for restricted stock is typically the same vesting schedule as the company would use for stock options. I am a fan of a four year vest with a first year cliff. The sale restrictions usually include a right of first refusal on sale for the company. That means if you get an offer to buy your vested restricted stock, you need to offer it to the company at that price before you can sell it. There are often other terms associated with restricted stock but these are the two big ones. A big advantage of restricted stock is you own your stock outright and do not have to buy it with a cash outlay. It is also true that you will be eligible for long term capital gains if you hold your restricted stock for at least one year past the vesting period. There currently is a significant tax differential between long term capital gains and ordinary income so this is a big deal. The one downside to restricted stock is you have to pay income taxes on the stock grant. The stock grant will be valued at fair market value (which is likely to be the 409a valuation we discussed last week) and you will be taxed on it. Most commonly you will be taxed upon vesting at the fair market value of the stock at that time. You can make an 83b election which will accelerate the tax to the time of grant and thus lock in a possibly lower valuation and lower taxes. But you take significant forfeiture risk if you make an 83b election and then don’t vest in all of the stock. If you are a founder and are receiving restricted stock with nominal value (penny a share or something like that), you should do an 83b election because the total tax bill will be nominal and you do not want to take a tax hit upon vesting later on as the company becomes more valuable. 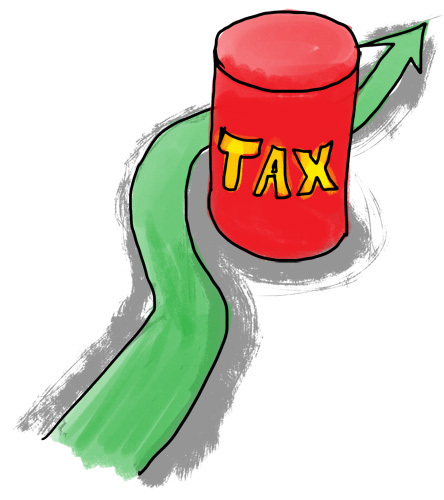 This taxation issue is the reason most companies issue options instead of restricted stock. It is not attractive to most employees to get a big tax bill along with some illiquid stock they cannot sell. The two times restricted stock make sense are at formation (or shortly thereafter) when the value of the granted stock is nominal and when the recipient has sufficient means to pay the taxes and is willing to accept the tradeoff of paying taxes right up front in return for capital gains treatment upon sale. Recently, some venture backed companies have begun to issue restricted stock units (RSUs) in an attempt to get the best of stock options and restricted stock in a single security. This is a relatively new trend and the jury is still out on RSUs. Currently I am not aware of a single company in our portfolio that issues RSUs but I do know of several that may start issuing them shortly. A RSU is a promise to issue restricted stock upon the acheivement of a certain vesting schedule. It is a lot like a stock option but you do not have to exercise it. You simply get the stock like a restricted stock grant. And there is an added twist in some RSU plans that allow the recipient of an RSU to delay the receipt of the stock until the stock is liquid. Combined, these two features may remove all of the tax disadvantages of restricted stock because the employee would not have a taxable event until the vesting schedule is over and possibly until the stock becomes liquid. I say “may remove all of the tax disadvantages” because I believe that the IRS has never tested the tax treatment of RSUs. Therefore RSUs are an “adventure in tax land” as one general counsel in our portfolio would say. I do not believe there is an optimal way to issue employee equity at this time. Each of the three choices; options, restricted stock, and RSUs, has benefits and detriments. I believe that options are the best understood, most tested, and most benign of the choices and thus are the most popular in our portfolio and in startupland right now. But restricted stock and RSUs are gaining ground and we are seeing more of each. I cannot predict how this will all change in the coming years. It is largely up to the IRS and so the best we can hope for is that they don’t mess up what is largely a good thing right now. Employee equity is a critical factor in the success of the venture backed technology startup world. It has created significant wealth for some and has created meaningful additional compensation for many others. It aligns interests between the investors, founders, management, and employee base and it a very positive influence on this part of the economy. We strongly encourage all of our portfolio companies to be generous in their use of employee equity in their compensation plans and I believe that all of them are doing that. This article was originally written by Fred Wilson on November 8, 2010 here.